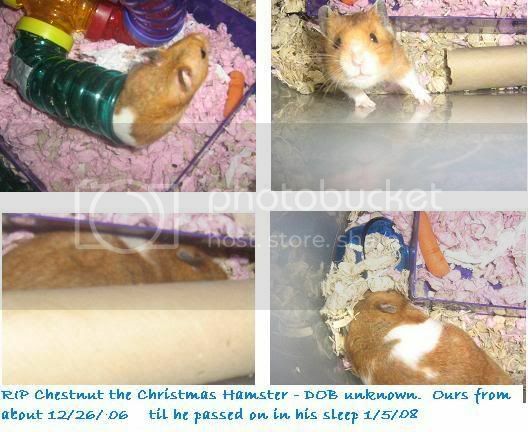 We are introducing Chestnut, who joined our family 12-26-06. He looks like Spice in a way, yet different. This was Spice who passed away in February. Chestnut has more white on him. Right now we’re just trying to distract Ryan from the cage…. More Christmas posting soon – have to clean up right now! Look at Flickr pics though – Christmas Eve, Christmas Day, Christmas Dinner at Gayle & Chuck’s (including pics by John and Brad), and the fuzzy ones are from my cell phone…..
GOOD NEWS – I have work. 90 minutes of dictation to work on transcribing until Monday night. It’s due Tuesday morning. And the kids have their camp at MRDD center today (Colleen volunteers) so Rog and I are still going to lunch (we think) and then I’ll type about 3 hours. I’m going to type now, and tomorrow early morning, too. I hadn’t worked since Jan. 31 so I was getting nervous! (Rog hasn’t found a full time job yet, but has worked 1 day for his traffic count job this month, and does have a part time cleaning job starting in March). I have 2 clients so far (this one now is from 2000 and I hadn’t worked for them since then, because I’d gotten that full-time legal transcription job at the end of 2000 and gave up all the others). 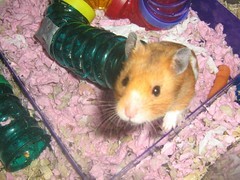 BAD NEWS – we found our little Spice (hamster) Angel expired in the sump pump last night. She was missing from her cage in the middle of the night when I woke from the couch, and with Colleen gone at the friend’s overnight and Rog looking for jobs on the computer no one got her down earlier. 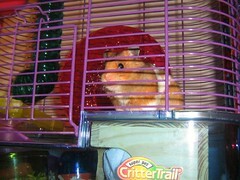 I expect she escaped sometime Thursday night after one of us put her back in her cage. She was such a sweetie. We will miss her very much. I was crying and crying. After sleeping on the couch 9-1:30 a.m. I ended up being up until 3:30 after discovering her and then crying. Then I got up at 6 to start typing. We still have a guinea pig (Reese) that my mom brought over to visit Colleen – she’s been her a few days. She’s sweet, but I don’t know her like my Houdini Spice — she ended up having 6 lives as that’s how many times she’d escaped without killing herself…..
must work now….hope these files are easy to hear.